On Friday 10/1/10 I'll be part of a group art show to benefit Arts Are Elementary. This non-profit organization brings artists into Brunswick elementary schools to work with students. I usually complete my paintings in one afternoon, racing the tide and waiting for the sun to reveal the shadows. Watercolor captures the flow of the ocean. It is also easier than oil paint to take on location. I use a digital camera to capture a moment. I edit the images in Photoshop Lightroom, but I don’t paint from photographs. 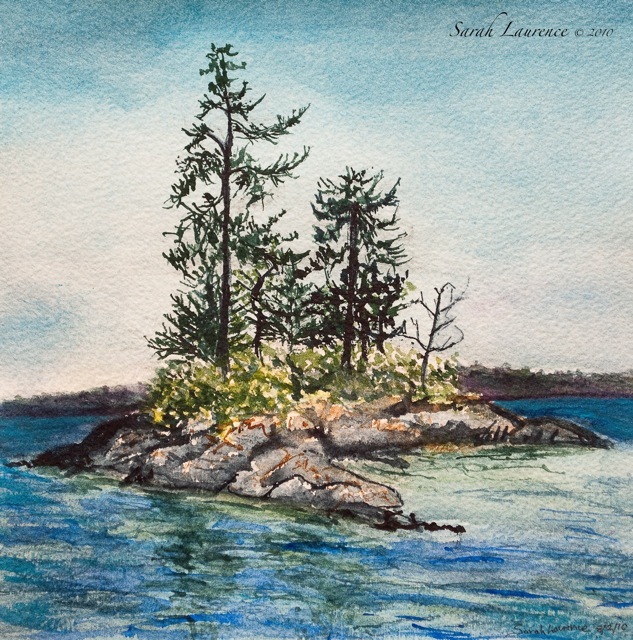 My studio is a rocky cliff, a secluded beach or a peaceful lakeshore. Lookout Point is a favorite place to paint. At low tide this miniature island connects to land, but at high tide the trees nearly drown. Before I painted landscapes, I worked from live models in a studio. Trees are the figures of the landscape, dancing across the page. You might know Basin Point better as the Dolphin Marina and Restaurant, famous for its lobster chowder with a blueberry muffin. 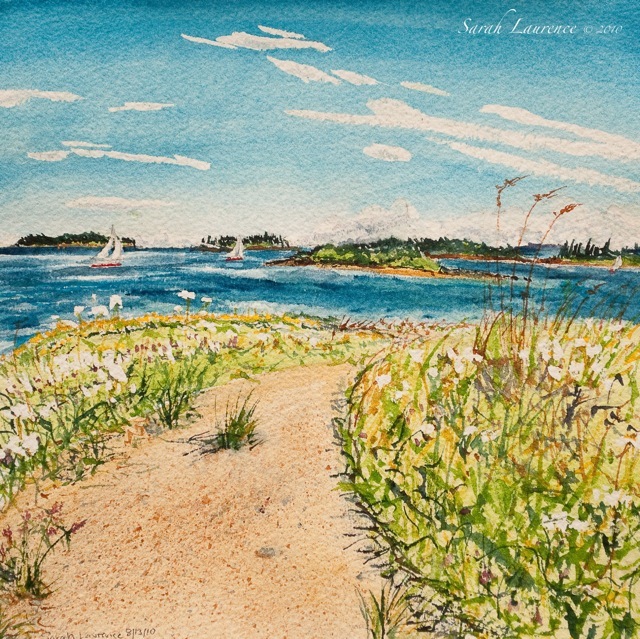 Next time you dine, take a stroll down the peninsula to admire the wildflowers and the islands of Casco Bay. Feel the wind blow. Friends invited my family to skate on an island. My daughter glided across rough pond ice as ocean waves broke on the nearby shore. 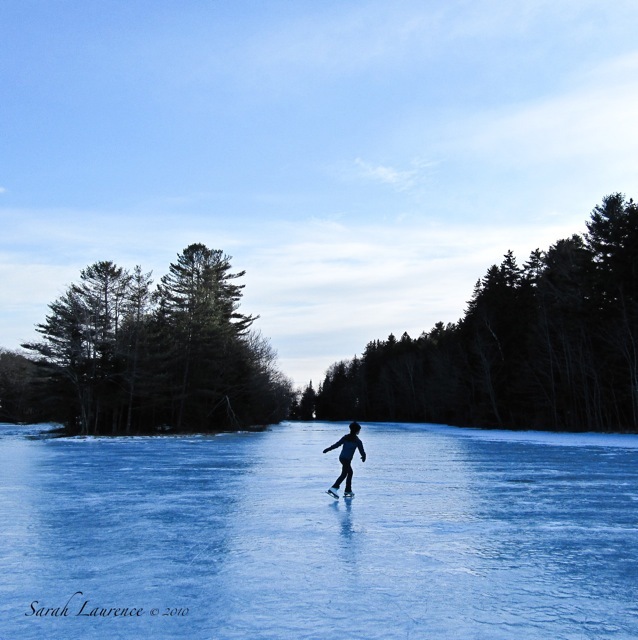 We skated until the sun dipped behind the pines, painting the landscape winter blue. Metallic paper glimmers like the ice. Blog readers might remember this image from my review of Beth Kephart's novel last winter. You can preview other pieces in the 10X10 Show online or in the gallery spaces from 10-3 on Friday. All pieces are 10X10 inches framed and priced at $200. Tune to WBOR (Maine Public Radio 91.1 FM) Thursday evening 5-6pm for a feature on the 10X10 fundraiser. The 10X10 reception will be from 5-8pm, Friday, October 1, 2010 in the Morrell Meeting Room at Curtis Memorial Library on 23 Pleasant Street and at St. Paul's Church Hall at 27 Pleasant Street in Brunswick, Maine. The show will be up for only one night. My work will be hanging in the church. I hope to see some of you there. Lovely paintings,Sarah. Hope all goes well with the art show! Have fun and I know whoever buys your work will love it! I love your paintings, Sarah. But then again, you knew that. There's something about that blue even when it's been put through the 'computer treatment' that makes me feel rich. It's very intense without coming across over the top. Many thanks for this visual present. Those are beautiful. The second watercolor is my favorite. Wonderful, wonderful, wonderful!! Love these. And I so wish I could be there to see more of your beautiful work! Well done! I love the Basin Point one. It makes me just want to walk right into it. Where did you stay on Nantucket? We stayed there once about 15 years ago. Love it. I'll be it's great this time of year when the crowds are gone. Goodness gracious, you are so very talented! Beautiful!!! That last one on the metallic paper ... brilliant!!! you are a true plein air painter - what stunning landscapes... and that metallic paper photo - i can almost feel the ice! This fundraiser for arts in education is very fortunate to have included you. I love these three pieces. Had not seen the edited photograph - and just love it! How talented you are. Hope the show raises a lot of funds for this worthy cause. Dear Sarah, How very generous of you to be contributing your work to this cause. Artists in residence in schools is such a worthwhile idea since allowing children to interact with the arts face to face is such a vital part of their cultural education. Otherwise, sadly, for large numbers of young people, they are probably never going to experience the work of artists or to meet with artists at close quarters at any point in their lifetimes. I do so hope that the event is a great success. All, thank you! Your positive vibes are very reassuring. It’s a fabulous cause and an art locus with over 100 artists participating. Elenka, we stayed with my parents in a house near Jetty’s Beach. Nantucket is fabulous off-season. Edith, the proceeds from the sales are split 50/50 between AAE and the artists. Frames were donated and assembled by volunteers. It is wonderful to bring artists into elementary schools. Maine schools are tight on cash as are artists in this economy. The blue seas and skies are beautiful! Love the second painting especially! Hope everything goes well with the show! These are beautiful watercolours, Sarah. I am envious of your outdoor "studios"! I love the idea of painting al fresco! You are an inspiration to me in many ways. And what a worthy project to support- have a great art show. What a great cause to be a part of. You're such a talented artist across mediums. I wish I could go to the show and peruse the art! I hope it goes well. These paintings are as lovely as your photos. Please tell me about the metallic paper. The photo store where I have things enlarged offers it, and I have always wondered why one would opt for it. Les, the metallic paper is especially good for water and reflections. It lends a cool tone and depth to the image as if it were printed on metal instead of paper. You have captured the essence of the Maine landscape perfectly...I love these watercolors...and am so very impressed...and I agree with Amanda.... picture the lone skater..you can feel the ice! Lovely paintings, Sarah, and the photo is spectacular! Hope the art show brings in lots of visitors; what a great fundraiser! I just love the High Tide painting. A lot of fun and success at the 10x10 Art Show. It is very inviting to have a look on line at the other art works. Hope it went well on Friday! The blues in Island Skating are stunning! All, thank you! A big rainstorm kept many at home, but 65 pieces sold out of close to 300. My “High Tide at Lookout Point, Harpswell” was the first to sell at my venue. I bought a textile collage by Catherine Worthington even though we hardly have any hanging space in our home. The weather has cleared, and I hope to paint again next week…before the landscape resembles that skating picture. I LOVE "High Tide at Lookout Point, Harpswell" and was headed to find out if it was still available but see from your last comment that it was the first to go. Yay for you! Cynthia, there was a bit of scramble for that painting when the door opened. The same thing happened the last two years, although I also had work that didn’t sell. I will be painting more oceanscapes this month and next summer. Some will be for this show and an art auction, but the others will be available on my website. It’s a bit of a juggling act with art, writing and kids. I’m hoping to paint one day this coming week. I love the clarity of fall light and the emptiness. I hope the show went well, Sarah. Once again, you capture the beauties of Maine for us. I can almost smell the pine and salty sea . . .
Bee, yes, the show was a success. I loved your sensuous comment.